You can get away with a sloppy handshake but with a carelessly built house? Not so much. Eventually, its qualities will deteriorate to the point when the only thing holding it together is pure luck. And you better call in the construction engineers before that runs out, too. Alpha Structural, Inc. presents itself as the only company in Los Angeles County licensed to engineer and build any type of foundation or hillside repair. 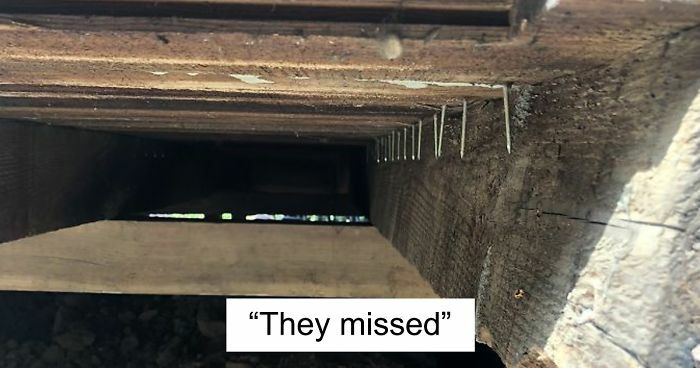 For its 25th birthday, the organization has decided to share some of the craziest structural construction fails they've found over the years, making many internet users question the sanity of some contractors. "Besides having a stellar reputation, we're called out to inspect and propose solutions to many structural issues," a spokesperson of Alpha Structural, In. told Bored Panda. "Specializing in advanced hillside foundation repair methods we mainly are called to inspect when there are issues such as sloping floors, failed retaining walls, etc." "A very common engineering fail we see is mid-century hillside homes that are sinking. They were often built with shallow footings that are prone to sink over time. Additionally, there is a lot of expansive soil in Los Angeles which, due to its high clay content, expands and contracts. This leads to corners or sides of a home that sink." Since the company has already inspected tens of thousands of properties, it's hard to catch its engineers off guard. "I would say we're more likely to be surprised by what's under the home than the structure itself! Although, while we are not alarmist in any way, every once in a while we will come across a structure that we are surprised is still standing." According to Alpha Structural, Inc., everyone living in the area can take measures to make their building a safe place. "We always recommend earthquake retrofitting your home," they added. "It's no surprise seismic activity is prevalent in Los Angeles, so taking the time to retrofit your home is key. Also, most foundation problems are caused because of no drainage, or poor drainage around the home. The most cost-effective solution to preserve your foundation is to make sure your yard slopes away from the structure and that your gutters and downspouts are cleaned and route the water away. However, it's easy to get carried away. "People tend to overreact when it comes to their home. Things such as hairline cracks and minor sticking of doors can cause quite a panic in most homeowners. Plenty of information about our services can be found on our website!" Continue scrolling to check out what epic fails these guys find daily and upvote your favorite entries! YES, this is a real skull & YES it was called in to the police and YES it was confirmed by a detective coroner. While doing a real estate inspection in the valley, one of our assessors came across the above skull. It was said to be found in Peru by the previous owners. Apparently, they brought it back in their luggage when returning from their vacation in Peru. Why they would do this is beyond me. This was later confirmed by the sellers of the property that it was in fact brought back over to the states from Peru. The skull, which was studied by the coroner, was roughly 1,000 years old. This is by far one of the craziest things we've seen doing foundation inspections in Los Angeles. wow. the scary part (if is true) is that it traveled in someone's luggage all the way from Peru and TSA did nothing about it. This was taken during one of our structural inspections in North Hollywood. It's gonna take a little more than duct tape to fix this one. Now, I forgot the term for these, but basically it's a massive hole/well that was about a meter under the concrete footing. The owner had no idea this was here. Must have been there for decades. Do I need to check under my house for this kind of shoddiness? I remember seeing an episode of Hoarders where a guy had a house like this. He had so much junk in his attic and the weight of it was all being held up by one sagging beam. One book falling over would have bought his whole house crashing down on him. God it was sad. Is this on the level? "I have sagging floors" And this is why. This is something you don't see every day: A colony of bees/hornets/wasps, have created a honeycombed nest on the carcass of a dead animal and it became the perfect online content. Nasty. This is a very interesting view from a basement window. It's actually located in a shower and you can see the critters moving around in the dirt. Hope you like bugs! Just saying, that's actually kind of cool. Nothing is worse than coming across a massive gas pipe while excavation. It wasn't on the initial plans. Digging here must be a blast! Though these jacks are pretty common...they should never be used as a permanent pier. Unless secured with duct tape of course. This is an abandoned home in East Los Angeles. I don't want to get too technical on this, but not even the homeless would want to set up shop in there. Lol--gives new meaning to the term "mobile home"!! This is one of the craziest structural fails I've ever seen. No re-bar, not bolted, settling 2 ft and it's on sand...Just wow! It looks like you could hit it with a hammer and the whole thing would come down. This is actually the door leading to Narnia. It just so happens that it's under a house in Pasadena, CA. Seriously though, they used this as a sort of "shear wall" for additional strength. Again, an obvious DIY job. Thats a perfect place to take that picture then! What is it? Bags of concrete? It reminds me of one of those traps created by Wiley Coyote in the Road Runner cartoons. It's simple, the floor is actually a balloon. Prepare to fly. The fact that almost all of the post & piers were like this is concerning! That only confirms my suspision that we are dealing with magic carpet dealers! A fact anyone knows, surely. How do these places get built in the first place? So from here we see there is a slope starting from the right and going 15 feet to left. After peeling back the carpet, we discovered a massive slab crack. To the right of the crack we see another crack that's been patched. The left side of the house was completely sinking a total of 18 inches from the point of the crack. One of the worst slab conditions we've seen so far in LA. otherwise your head might fall off...? Let's just say it's a little over-engineered. I don't know...I bet you don't see in cracks in any of THOSE floors! Why was this inspected? For insurance purposes? So they could get a demolition permit? They might want to add a "Do not park next to this obviously failing retaining wall because it might fall on your car in the night and we're not paying for it" sign. There was a parking lot on West Colorado Avenue in Colorado Springs where a wall had been built at the bottom of a hill like this. It gave way, and buried a car. This is a disaster waiting to happen. A large area of the back patio is basically floating on this hillside. Also, you can clearly see my finger in the frame. it's still there because of the tree roots is holding it, PRAISE MOTHER NATURE! Maybe thats why there are two others/new ones? During an inspection in Los Angeles, we came across this brittle, failing foundation made of brick. The mortar simply fell right off of the brick in a dust waterfall. An earthquake would more than likely demolish this home. Ballsy move playing jenga underneath a house, don't think i'd fancy being under there..
Post that's barely resting upon a concrete pier. This one is undermined and probably one good shake away from collapsing. Don't wipe away those cobwebs…they're holding it up. It's a bucket filled with sand, not concrete, used as a concrete pier. Code? Nope. Aesthetic? Nope. Funny? Yep. Are these all in California? How do they not all just slide into the ocean? This speaks for itself. If you're wondering about the filter, I lost the original. All I have is our Instagram photo. Fill it with Great Stuff for wide gaps, paint it, and call it a feature. Let's play a game of Jenga in the back yard. Is this build to keep an inpending landslide out? A big concrete block, random wood members and plywood. That should do. Did a structural assessment for this home and the lady was wondering why her home was sloping 7 inches. Some classic LA settlement. I think the house is about to take off! How many balloons do they have on the roof? The roots basically said F**K YOU and broke the wall with ease. This was a very interesting hillside home that was sliding down the hill. They needed an engineered wall to keep the house from cracking down the slope. The driveway keeps getting longer though. This one is subtle but the property is shifting like crazy! The back wall is bowing quite a bit and in the top right, where the stilts connect to the overhang, you can see the waviness of the connections and how unstable it really is. Do they have building codes in LA? A few more inches down and that would have made a nice half-pipe for skateboarding. Image below shows the cause of this dip! It's not weird that they built a brick patio on top of a wooden deck? This was found under a house. Somebody undermined the entire footing then stopped the excavation and left. Sounds like something a dog would do. This is a sump pump. It should be isolated in a plastic or concrete basin to collect water. This was installed into dirt. Fail. Knowing sump pumps don't like mud, how often do they have to replace it? Water was constantly getting into the wall. This is the ugly result! They did it right in the 1920's. Not. That concrete or whatever it is looks like a monkey head. "who goes under a house to steal a wooden block off a pier?" Seems that they mixed every piece of rubble after a demolition and made a wall with it. "I tried fixing it myself but I thought I'd give the experts a call"
A lot of people really don't have the money for experts. Many people inherit their parents home and the problems that come with it but no money to fix it. A pier with the footing sinking 7 inches down on the right. There were 6 others just like it under this property. Why are these made with so little contact? Shouldn’t they be wider where they meet? Just don't stick your hand in there...the house could bite. The whole house is resting on that pipe in there! This may look like a cool, industrial ceiling pattern in a DTLA villa, but it's actually water intrusion coming through the cracks above. This was a failed retaining wall that we're fixing up. It actually wraps around the front (which you'll see below) and the pressure underneath and farther up the hill caused it to fall over and collapse into the street and into the neighbors yard. What occurred was called a "surcharge" and it's when the pressure from the structure puts too much tension into the surrounding soil that it slowly gets pushed outwards. Well built wall it stayed in mostly one peace. just badly designed for that location. This is a deck that extended past the garage doors below it. Needless to say, it had some insane wood-rot underneath! In the photo to the right, you can see the once sturdy deck was held together by a massive framing bolt. Now it's free floating. This is the side of a home that had awful water damage and wood-rot. The walls were so badly damaged and damp, they began to buckle and burst open, exposing the interior framing and causing the house to sink on one end. This is a pretty severe crack in the concrete foundation of a hillside home. Metal strapping is one solution to this, though it's never recommended because the problems will persist and show up again in a few years. Replacing this section would be the correct action. You don't have to be an expert to see there's an issue here. The foundation and framing connection (cripple wall) is buckling out toward the driveway. This is causing sloping floors, interior and exterior cracking and sticking doors. What’s the solution? Knock the building down? Annie Lennox sang about it didn't she? I’d cut my losses and move ... FAST! A pier made with brick & mortar...No Bueno! Why it has to be wood? A spider made this crack it's home and now we can't do the work. We don't want to tear a spider family apart like that. A missing pier will inevitably cause sagging of the sub-floor. Well, it does the job but it's not strapped and it could cause future damage. Is that literally a 4x4 with leftover drywall on both sides? This is more of an art piece that was built into the foundation. There's rock, a cinder block, 2x4's and a metal plate, all tied into the foundation. Beautiful, elegant, illegal. Oh, I LOVE this piece, it speaks to me! It's saying, "Disaster imminent." This is actually a project that we took on and it's almost done. This is a VERY steep hillside up in Hollywood that was collapsing and continuously falling and creating more damage to the hillside. We drilled piles down about 30 feet to bedrock for stabilization and added a new retaining wall system for the upper tier. At this point it's not worth repairing. Just replace the foundation. How do you do that to an already-standing house? The result of bad water proofing: Spalling Concrete. This was the "foundation" of an old school built in the early 1900's. Completely made up of rock and rubble, this would in no way survive an earthquake. We're redoing the entire foundation. I can foresee imminent danger in a lot of America’s infrastructure! This was a massive 30' retaining wall in the back of a few properties. There's nothing really "wrong" with it, other than it's clearly uneven at most points and it seems to have been un-permitted. A pool at the bottom right clearly indicates the real reason the wall is there; cliff diving practice. Great idea to buy a home next to a wall retaining a high hill. A post that's barely resting upon a concrete pier. This one really makes me chuckle because it looks like the feds are using a spotlight to catch a felon (Dasani bottle) on the ledge of a skyscraper. DON'T MOVE! We've got you surrounded! This pier has simply given up in life and is allowing the process of earth decomposition to take place.